Since Bryant and I are raising our kids as Universalists/ Secular Humanists, (if one insists on a label) we embrace a variety of religious traditions, and we use them to teach the kids about the world. One of our favorites is the Mexican/ Central American holiday, the Day of the Dead. It combines traditions of the Aztec festival commemorating the dead with the Catholic tradition of All Saints and All Souls Day. It’s a bit like Memorial Day in the US, but much more festive! We see it as a great way to teach our kids about death. The tradition has gone mainstream in the US during the last 10 years or so. 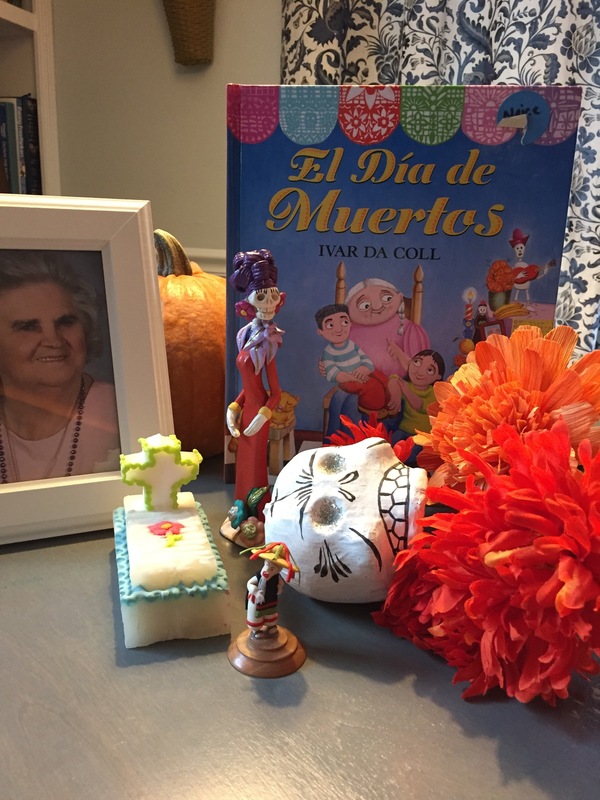 Here in Minneapolis you can buy most of the traditional things for the celebration…pan de muerto, papel picado, calaveras de azúcar. Even Target is in on the action. This year they had lots of Day of the Dead products! Stores in Latino areas even brought in fresh “cempasuchil” flowers, like marigolds, used for decorating grave sites and altars. My friends from Mexico have given us some beautiful decorations for our altar. This year we celebrated the memory of Bryant’s grandma, Oma, who passed away in May. We make recipes that our loved ones made or enjoyed, and we tell stories of that person so the kids will have some memories of them, too. It’s a beautiful thing!